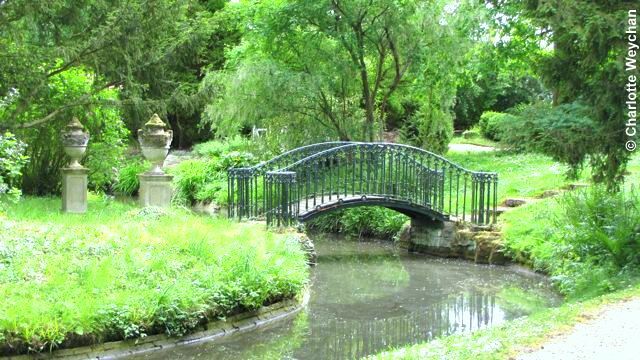 If you're looking for an English garden that's a little different, the Swiss Garden in Bedfordshire is certainly worth visiting! It began life in the 1820s when the third Lord Ongley inherited the Manor House at Old Warden Park and breathed new life into the landscape there. He also built the Swiss Cottage (above), which perches on its own slope at the heart of the garden, reputedly for his mistress, who came from Switzerland. 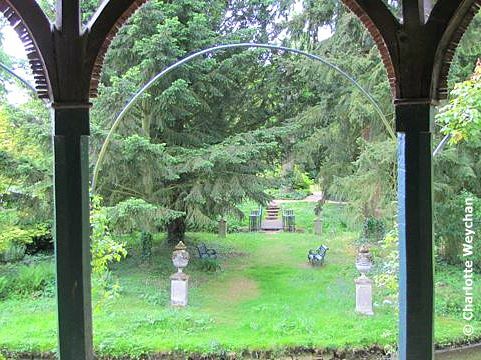 But in 1872 he sold the estate to wealthy Victorian industrialist, Joseph Shuttleworth, who created the somewhat eccentric garden, complete with grotto, that survives today. The Swiss garden is part of the Shuttleworth Collection, which also includes a collection of vintage planes in hangars. Typically Victorian features including wrought ironwork, stained glass work in some of the buildings, a grotto and fernery all add to the eccentricity of this nine-acre garden. But it narrowly escaped dereliction in the 1970s and was finally saved from ruin and restored by Bedfordshire County Council. Today it's a fine example of a Victorian garden and although you won't find stunning border displays here, you'll find a truly tranquil landscape, and some stunning specimen trees. Part of the charm of this garden is the winding canals that run through the middle of it, the random pieces of statuary dotted around, the wrought iron bridges that criss-cross the water and the strong emphasis on thatch. When the Shuttleworth family bought the garden they added a fernery grotto (closed on the day I visited, so no pictures here). You won't find flowerbeds or herbaceous borders here, just a green landscape, several surprises and a general sense of well-being. The garden is especially glorious in springtime, when the azaleas and rhododendrons are in bloom. The Swiss Garden is open throughout the year, from 9.30 am to 5.00 pm. Combine this with Toddington Manor for a great day out, but hurry, because Toddington is closing at the end of July. Other must-see gardens in the vicinity include Ascott and Waddesdon Manor. Love the Swiss cottage, and the canal. 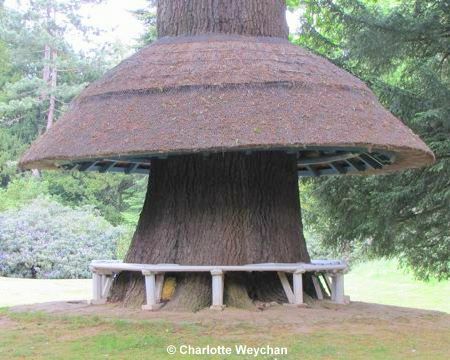 What an ingenious idea to put a thatch roof around a tree! How delightful. I love the thatch! Ah-h...that I could take some time away every day to set a spell in that Swiss Cottage...heavenly! What a lovely and peaceful garden! Thanks for sharing it with us. That's the most charming thatch I've ever seen- and I've seen handfuls of charming thatch! 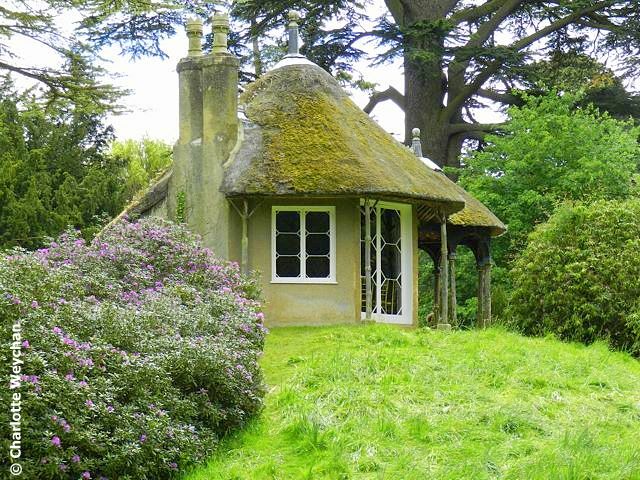 I love the idea of a tiny little cottage in a great big garden. Of course, there's also the manor house you mentioned on this estate, but nonetheless, the mistress inhabiting the cottage must have been fairly secluded. The last image was amazing. I would love that tree. In fact I would love that house too, but not mistress duty though.